David Hall’s Daughter developed a love of football at a very early age and played for a boys team in Bradford-on-Avon until she was 10 years old. She was a skilled two footed player who could read the game and became an outstanding tough tackling defender. When she finished year 5 at the Junior School she was banned from playing in a mixed team and after her final game in the boys team it was the boys who were crying because they knew they had lost their best player. In today’s world a 10 year old girl would have no problem joining an Under 11 Ladies Football Club and most villages have a flourishing female football forum. However, back in the early 1990’s there were only a limited number of female football teams in Britain and David struggled to find a team locally for his Daughter to play competitive football games. Luckily David heard about Keynsham Super Strikers, based 22 miles from Bradford-on-Avon at the grounds of Keynsham Town Football Club. There was a long journey to get to the training sessions each Saturday morning, taking the ‘southern ring road’ around Bath. Every time David and his Daughter passed Hilliers Garden Centre David used to say, ‘if we had a £10 note for every time we passed here,’ and his Daughter would reply, ‘we would be millionaires Dad’. As there were only a limited number of female teams in the South West, Keynsham Super Strikers had to go on long distance journeys for competitive fixtures in towns as far afield as Totnes, Barnstable and South Moulton. In the early 1990’s a lot of David’s weekend activities were involved with football and Keynsham seemed to be at the centre of his world. Ian used his management skills to get the best out of the players. Kevin, a technically gifted former Footballer, used to create interesting training routines. David’s main role was to provide 5 minutes entertainment, helping the girls to relax before the game. During the 2010’s David, Ian and Kevin gave up their football involvement but each December they meet up in The Ship Inn at Keynsham for an evening to reflect on the past and to update each other on developments in the past 12 months. Ian and Kevin often recount David’s best 5 minutes which was judged as being in Swindon when David gave a rendition of The Rolling Stones ‘Not Fade Away’ changing the lyrics to fit Rovers A team beating Swindon Spitfires. Ian and Kevin argue about what was best, David’s harmonica playing or the words he had constructed! Retain possession, if we have the ball they can’t score. Long ball, short ball, it doesn’t matter as long as it is a good ball. You have never won the League until the medal is in your hand. Every Christmas on his journey to The Ship Inn David passes Funeralcare in Keynsham and seeing the vintage hand bier in the window he often said to himself, ‘One day I’ll get a job with my lorry from that branch.’ Each year David sends a Christmas Card to Sue Hole and Sue Beint and the two Sues welcome David’s call each November to check that everything is the same or if anyone has changed their surname since last Christmas. Fast forward to 2018, Sue Hole rang David regarding a funeral from Keynsham to Haycombe Crematorium. David did his normal due diligence in checking out the loading facilities using Google Street View and saw that a common entrance seemed to exist between Funeralcare and the Kingdom Hall of the Jehovah Witnesses. David was concerned about the road being blocked by people badly parking cars. David spoke to Sue Hole and she explained that building work was taking place around the entrance and that it was best for him to come and judge the facilities for himself. David introduced himself, handed over a business card and explained how he needed to get his lorry into Funeralcare’s yard the following Wednesday. The Site Forman explained that he was contracted to do the groundwork for a block of flats and although he was polite he was obviously distracted by calls on his mobile that related to his project. From the limited words which the Site Forman spoke, David detected a slight scouse accent. When the Site Forman said ‘Anfield’, David could see a way to gain his help. David shook his hand and said, ‘You don’t know me, but you will know a distant relative of mine, Bob Paisley.’ The Site Forman’s face lit up. Stop all work on the site when David arrived with the Leyland Beaver. Use his men to stop the traffic entering or leaving Tesco. He would guide the Leyland Beaver back into the Funeralcare yard. David Hall phoned David Mullen the day before the funeral and David Mullen explained that the project had moved on and concrete was being poured on the Wednesday, however, he would ask the driver to make an early start so that the vintage lorry would get into Funeralcare. He told David Hall not to worry as he would help him. Now that Double Yellow Lines had been introduced in David’s street, for the first time in 16 years David could have a lie in, have his breakfast and leave for the funeral at 0900 hours after the school rush had subsided. Previously David always had to get his lorry out of the street prior to 0700 hours in case of obstructive parking preventing the vintage lorry getting onto the main road, which meant that he went to bed early the night before a funeral. Many a night he would watch the first half of a football match on the TV before getting into the bath, however, for this Keynsham funeral he watched the whole game in which Swansea beat Notts County 8-1 in an FA Cup game and Nathan Dyer, who went to the same school as David’s Daughter, scored twice. David was out of his comfort zone leaving at 0900 hours, however, he found the motorists on the A36 quite happy to sit behind the Leyland Beaver trundling along at 32 miles per hour. David got through Bath in 10 minutes and pulled into Keynsham slightly earlier than he had previously indicated. 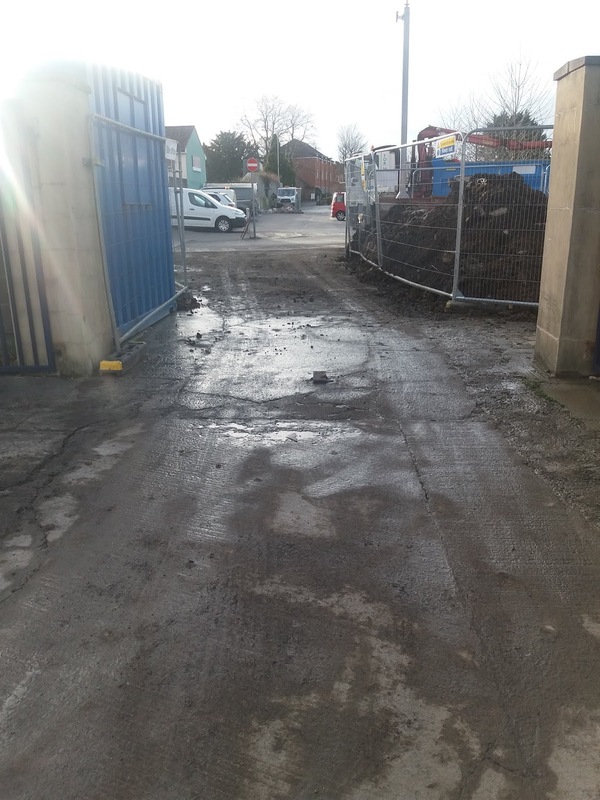 David approached Tesco Car Park from the Bristol Road entrance and as he turned the corner he was horrified to see that the cement mixer was still there and was occupying the space that David needed to turn right into the Tesco Car Park before reversing back into the Funeralcare yard. David spoke to David Mullen who asked if David could still get into the Tesco Car Park even though the cement mixer was in his way. David said that the lorry had an amazing lock and he would make an attempt. David Mullen got two men to stop the traffic and he wished David all the best. When the men told him that the coast was clear, David put the vintage lorry in the lowest gear and as he pulled along side the cement mixer he assessed the task. He had to turn the old girl through 90 degrees in a distance of less than 20 feet and he had to watch that he didn’t hit the cement mixer, sign post or any car. As the Leyland Beaver edged forward on tick-over David applied full right lock as quickly as possible and then it was like watching everything in slow motion with the Beaver spinning on a sixpence and the sign post was near the corner of the cab and the rear off-side tyre was dangerously close to the corner of a car. Miraculously David got the lorry around into Tesco Car Park without hitting anything or anyone, as pedestrians were taking no notice of the Builders who were controlling the traffic. Reversing back into the Funeralcare yard wasn’t a walk in the park because the builders had put a kink in the steel wired fence which introduced a pinch point of less than 8ft wide. David had to put in a shunt and the fence was extremely close as the Leyland Beaver, which is 7 ft 6 inches wide, went through the gap. David spoke to a number of the Builders and arranged for the fence to be straightened and although there was much activity whilst David was loading the flowers and soon as 1145 hours came the place was like the deck of the Mary Celeste. David got out of the yard without a problem and Steve was impressed with the performance of the Leyland Beaver on the big hills leading to Haycombe Crematorium, in fact the cortege arrived 15 minutes early. The route from the house to the crematorium had involved going past The Ship Inn and David recounted that his football connections had been invaluable on this funeral.